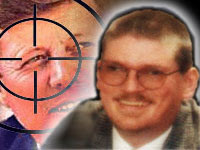 On June 28, 2007, I returned to RED ICE RADIO, where Henrik and I talked about President Kennedy's assassination, and the occult aspects of both the Dealey Plaza location, and the assassination plan itself. Earlier today, my latest interview with 'Red Ice Radio' was posted online to the 'Red Ice Creations' website. Show host Henrik Palmgren and I discussed my 12,000 word report on the JFK public execution, at the hands of those who maintained in the days leading up to the assassination, that our sitting President had committed TREASON; for wanting to knock the CIA down to size, trying to end U.S. involvement in the Viet Nam war, and for ordering the printing of a new silver-backed currency which was called 'U.S. Notes,' about $4 billion dollars of this currency was printed. Very few of these U.S. Notes ever made it into circulation, and today, they command top dollar in the world of currency collecting. In the interview, the link for which can be found below, Henrik and I also discussed occult numerology, qabalism, astrology, and the black magick that the high-level Freemasons practice. We also talked about the Freemasons who seemed to be everywhere throughout this entire event, and its' aftermath investigation by the Warren Commission, which was chartered to provide the OFFICIAL-FICTION of the event. I hope to be able to educate people on some of the high-strangeness of this horrible event, an event that has haunted me throughout my entire life. The reason for this, is that I was born with a photographic memory, a high IQ, and an extremely honest morality -- and this event also forms the basis of the earliest memory I have of my entire life. You see, JFK was murdered the day before my second birthday. The fifth episode of THE KENTROVERSY TAPES podcast features an interview with Michael Tsarion, the truth-telling researcher, author, lecturer, and creator of the 22-DVD ORIGINS AND ORACLES series. 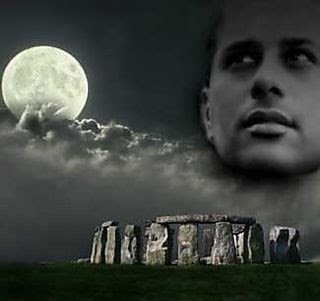 Michael Tsarion is also the founder of the TAROSCOPES MYSTERY SCHOOL, which teaches the divination arts through astrology, qabala, tarot, and numerology. Michael Tsarion is the founder of the TAROSCOPES MYSTERY SCHOOL, which teaches the divination arts through astrology, qabala, tarot, and numerology. The following interview from podcast # 05 was recorded on March 15, 2005 from 10:00pm to 11:15pm EASTERN. It was originally recorded for later publication in the Maybe Logic Academy student organ, Maybe Quarterly, and it appeared in issue number three of the publication, which was published online on June 21, 2005 (vol. II no. II). Michael and I talked about the presence of EVIL and how it came to infect the Earth, and her inhabitants. It was an extension of the many subjects that he wrote about in his book ATLANTIS: Alien Visitation & Genetic Manipulation. We also discussed many aspects of the Mayan Age of Revealing, and what Michael sees as we get closer to that magickal date of 2012. On June 18, 2007 -- Vyzygoth and I take a look at three topics that are high on my list of present concerns -- the situation with Ed and Elaine Brown in New Hampshire, involving their federal tax prosecution; illegal immigration, and the North American Union -- which a large percentage of the public does not want to acknowledge is being constructed around them. 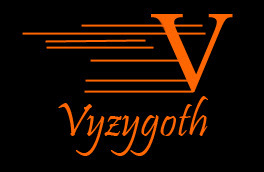 Earlier today, my June visit with Vyzygoth was posted online. I thought that it was important to discuss three major subjects which had been on my list of concerns lately. I also briefly mentioned that I had endorsed Dr. Ron Paul in the 2008 election, which I did in a June 1, 2007 endorsement article on this very website. We began with Ed and Elaine Brown, and their tax case and prosecution in New Hampshire. I provided full background on the case, including the events of June 7, 2007 -- when their lives were quite literally saved by a dog who had to go for its' morning walk. I also commented on how this case was being completely blacked out in the mainstream media. Next, I moved on to the North American Union, and discussed the way in which this is being done without public knowledge, feedback, or support. Remember, if it is a GOOD THING, then it doesn't need SECRECY! The third episode of THE KENTROVERSY TAPES podcast features part one of a two part interview with Freeman Fly, the Internet truth-telling broadcaster, documentarian, and journalist. Freeman is the host of the award-winning television show THE FREEMAN PERSPECTIVE ... this guy is one of the most fascinating people I know! A couple of years ago, I began to hear about this new face on the esoteric research scene -- Freeman Fly of quite an intriguing television show THE FREEMAN PERSPECTIVE. On his show each week, he would have on these guests -- some were famous, others, not so. But, all had interesting information to impart to the viewers. I contacted Freeman in February 2006 about doing his show, as I thought that what he and I were both trying to accomplish was similar, and that I was interested to see what the result would be of my inquiring about an opening on his show. 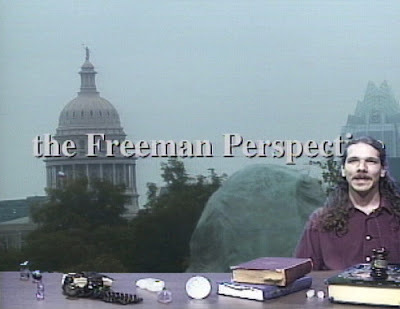 As it would come to pass, I was invited on THE FREEMAN PERSPECTIVE and appeared in the last week of March 2006. 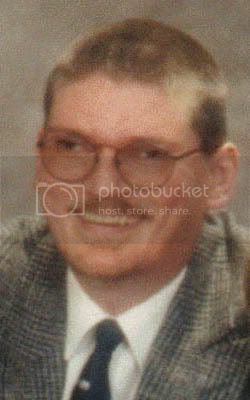 This show is available both on the Freeman Archives website, as well as appearing here, on THE KENTROVERSY TAPES website, under March 2006, in the archives section. How Freeman got his start with his TV show. Freeman talks about his parents, and the interesting positions they held within the system of Freemasonry. How Freeman became an award-winning, internationally known, television producer and journalist. Why The Freeman Perspective is on hiatus, and when it is coming back. Freeman talks about "Synchronistic events that come from a miraculous source, what I can only classify as devine." Freeman's cross-country trip as the archetypal 'Fool' of the Tarot, and how when he came back home, he was no longer the Fool, but the Magician (of the Tarot, symbolically speaking). Freeman talks about how the Universe provides when one surrenders themselves to serendipity, and he gives many examples of how this plays out in his own life. Freeman discusses his essay 'Anna Nicole, Britney, and Mind Control,' and what feeling overwhelmed him when he was finished with the essay, and WHY. Freeman and I talked about the Satanic Ritual Abuse similarities in the cases of Jon Benet Ramsey and Daniellynn Stern, the daughter of the late Anna Nicole Smith, who was apparently "Thrown from the Freedom Train." This is a reference to the murder of a mind-control slave. How Freeman got his TV show on in the community that house the single largest retired CIA population of anywhere in the USA, and how THE FREEMAN PERSPECTIVE came to be on WQXP-TV in St. Augustine, Florida USA. We also talked about Freeman's recent cross-country research trip, which will be released on a forthcoming DVD, I am told. How Freeman was able to predict 9/11 to the very day. How Freeman was able to predict Bush Jr. being railroaded into office, many years before it actually happened! Finally, we talk about Freeman's prediction for October 13, 2007 -- an important 700th anniversary date related to the purge of the Knights Templar by the King of France, in the year 1307. On Friday afternoon, April 20, 2007 -- I had taped an appearance on the 'Occult of Personality' podcast. The interview was supposed to be one hour long, but, as Greg and I began talking, we both quickly realized that we should just keep the recording going, and in all, we talked for more than two and one-half hours. Friday, April 20, 2007 | 6:00pm-7:00pm EDT | 56:31 mins. This was eventually released as a multi-part series, with the final portions released today, June 6, 2007. The total running time for all three parts of the interview are precisely 2:35:37; or two hours, thirty-six minutes. The subject matter was simple enough to describe to listeners, and I spoke about how the elites use Talismans and Black Magic as part of their mass media projects, as well as a technique called VIRAL MARKETING to get their projects into the subconscious of the audience. We spoke about examples of black magic in the mass media, through the material of Alan Moore, an occult graphic novelist. Additionally, we spoke about Led Zeppelin IV, and how that album was constructed as a talisman, a hyper-sigil, and a pentacle. This album has sold over 23 million copies in America, and an equal amount abroad, and is one of the top selling albums of all-time. In addition, the Led Zeppelin IV track entitled Stairway To Heaven has consistently been recognized as the most-requested song of all-time, in the entire history of broadcasting in America. Yet it can take a more malevolent form as does some political marketing. Kent’s expertise in these areas is invaluable. Listen as he breaks down the characteristics of these marketing campaigns and explains the connections between their composition and success." Earlier today, Greg posted the other two parts of the interview, and it all fell into place rather well with the previously released part one. Wednesday, June 6, 2007 | 98:31 mins. "In a continuation from podcast 11, KDB elucidates on the American political landscape, the upcoming 2008 Presidential election, and the Iraq War. In addition, Kent shares his thoughts, as a long-time research journalist, on eso-research, alternative media, and the nature of certain well-known reptilian concepts. Always informative and outspoken, Kent brings his years of experience and expertise to analyse the current situation. The audio recording has been split into two separate .mp3 files for downloading and listening. This is the second-ever episode of THE KENTROVERSY TAPES, which features an interview with Kevin Booth, of Sacred Cow Productions, who was the best-friend of the late comedian and political philosopher Bill Hicks. Kevin and I spoke about many aspects of the life and times of Bill Hicks, and some details about the types of projects Kevin is now involved in. In 2005, Kevin published the Bill Hicks biography BILL HICKS: AGENT OF EVOLUTION. Kevin was kind enough to send me a signed review copy, and I was so impressed with the book, I wrote a favorable review for Kevin's website. This review also appears on THE KENTROVERSY PAPERS website. The music that is featured in this podcast, is Bill and Kevin's band MARBLEHEAD JOHNSON. The opening song is LAY OF THE LAND, a seven and a half minute blues song heavily influenced by THE DOORS. Many people do not know this but, both Bill and Kevin were accomplished musicians, and Bill played guitar and sang, while Kevin played the bass guitar. Prepare to open up a brand-new door! After these lines are spoken, the album and Bill’s last words fade into a swirling wind that slowly fades into the silent void. It is something that chokes me up, no matter how many times I hear it. NOTE: This episode has a much better sound quality, and I am learning sound editing and mixing in order to do this podcast. So, thank you for your understanding of this matter.